Would you like to know what the best places to visit in Central and South America are?Then you’ve come to the right place. There are so many countries to choose from on the South American continent (and the southermost top of the North American one) that it can be rather overwhelming to plan a trip to the region. Distance, accommodations, exchange rates, and language are just some of the many obstacles that might also come into play, especially if you like exotic destinations. Some countries are simply not well prepared to receive tourists, while others have turned tourism into a booming industry and make it as easy on tourists as possible. In one of our previous lists on the top 10 travel destinations in South America, we presented a series of wonderful places to visit that you might want to check out. However, we realized we came up short, and thus we decided to create a list of the best places to visit in Central and South America. After all, the similarities amongst Latin American countries is noteworthy: most of them share the same language, a common heritage, have beautiful beaches, and great food. If you are currently living in the US, these countries are also relatively close, meaning you won’t have to endure an endless flight. In addition to favorable exchange rates, most of these countries are used to receiving tourists and offer great services that will make your stay that much more enjoyable. The best places to visit in Central and South America not only possess natural beauty, but also have rich cultures. Whether you enjoy visiting ancient ruins, going to the theater or visiting museums, these destinations have much more to offer than just sandy beaches and all-inclusive resorts. While some countries are more sophisticated, others offer an ancient heritage dating back centuries, making your travel that much more interesting. Let’s take a closer look at the ten best places to visit in Central and South America and see what wonderful places await those who decide to make the trip south. 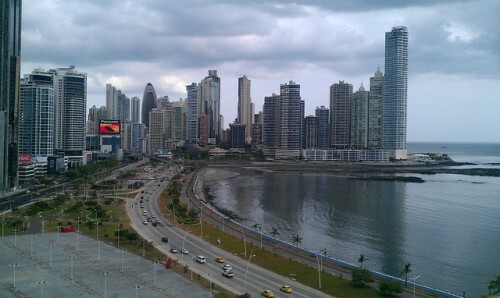 The capital city of Panama is definitely a place worth visiting. Visitors will be greeted by a wonderful waterfront and an abundance of high rises in this city that is sometimes compared to Miami. Panama City was chosen as the American Capital of Culture in 2003, meaning you won’t run out of things to do during your visit. The list of best places to visit in Central and South America continues on the next page with a UNESCO World Heritage Site.